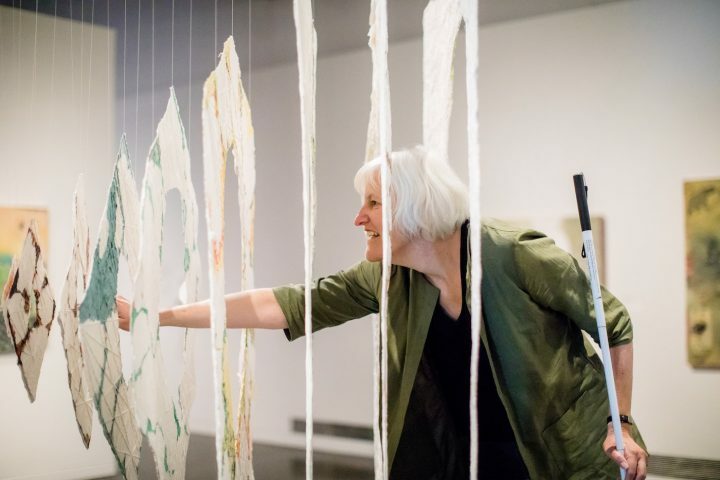 Most recently, Georgina Kleege led tours at the Contemporary Jewish Museum, where visitors handled materials that artists had used in their work. 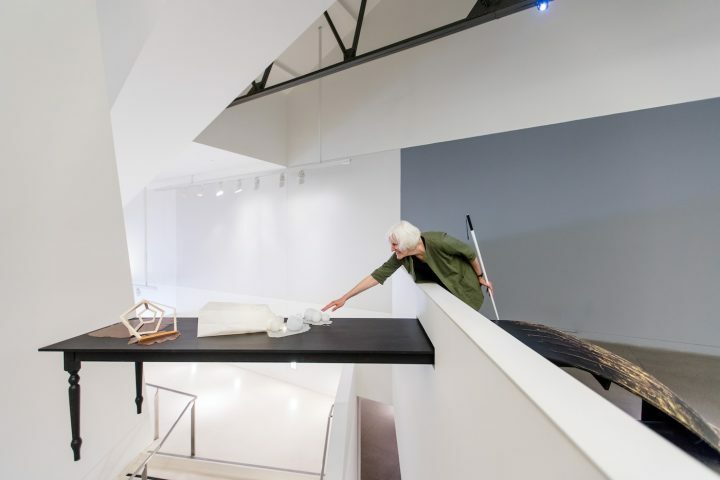 SAN FRANCISCO — Over the past decade Georgina Kleege has offered consultations to art museums, including the Metropolitan Museum of Art and the Tate Modern, on how to make their art accessible for blind people. An English professor at the University of California, Berkeley, Kleege recently published More than Meets the Eye: What Blindness Brings to Art, a book about how blindness is represented in art and how it affects the lives of visual artists. Kleege, who is blind and has been on many touch tours of museums, has long seen the potential for institutions to do more. The daughter of a painter and a sculptor, she grew up going to artists’ studios, galleries, and museums, and has advocated for such spaces to go beyond ramps and ADA compliance. Her most recent project, which she called “Haptic Encounters,” took place at the Contemporary Jewish Museum in San Francisco, and was realized in collaboration with the museum’s Access and Community Engagement Manager Cecile Puretz. For the exhibit Jewish Folktales Retold: The Artist as Maggid, Kleege developed six audio recordings where she relates the folklore that the pieces were based on, as well as describing how the artworks feel, from rough and sandpaper-like, to wooden and splintery. In addition, she invited featured artists to share models and materials of their art for people to handle. According to Kleege, this emphasis on the texture of materials and how they inform an artist’s vision is unusual among tours for the blind. And there’s another key difference: tours and audio recordings are almost exclusively done by sighted people; to have them led by a blind person is unique. On a tour of the exhibit, participants handled silicon squash, a material used in Michael Arcega’s sculpture, “The Enchanted Island,” inspired by a story about a shipwrecked rabbi going into a mansion and finding two objects on a table: a cornucopia and a ram’s horn, to summon people to prayer. 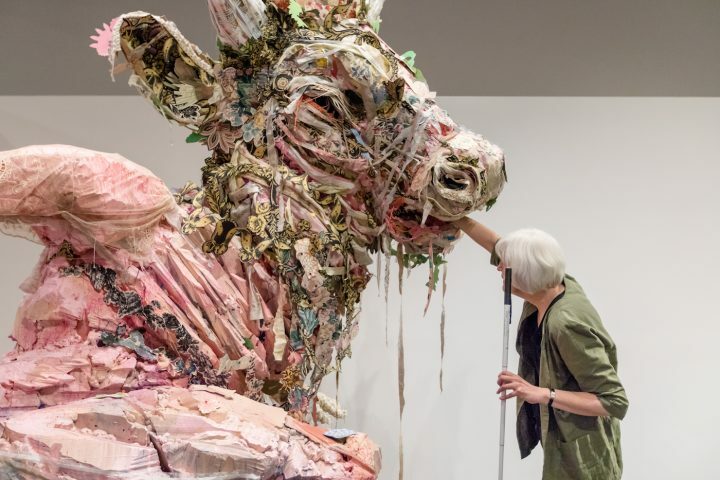 Visitors also held an animal’s head made from the leftover materials that Elisabeth Higgins O’Connor had after making her monumental sculptures based on Golem, on view at the museum. Kleege stresses how visitors to art museums, both sighted and not, long to touch the art. At the Contemporary Jewish Museum, people exclaimed over the rare chance to handle the materials. Later, in her office on the Berkeley campus, Kleege talked about what she learned growing up with artists as parents, what it means for a museum to be truly inclusive, and how she’d like everyone to touch the art. Emily Wilson: How are your audio and touch tours different from others? Georgina Kleege: There’s been a long tradition of touch tours at museums for blind people and also a long tradition of audio tours. So what’s different here is that in a typical situation the information is being given by a museum docent, who’s almost exclusively a sighted person. So then the sighted person gives information to the blind person, and the blind person goes home. I’ve taken advantage of touch tours in museums around the world, and anybody who hears about it says, “Oh, what’s that like? I wish I could touch the sculptures.” So I tell them, and I figured I could tell other people. That was the impetus here. I’m given this incredible privilege to do something other people don’t get to do. So in reciprocation, I say, let me tell you what the experience is like. This is the first time it’s been done in this particular way. Sometimes touch tours are set up as though the point is to feel the outlines, like this is a horse or a woman’s body. Actually, what I think what’s more interesting has to do with the materials: What does marble really feel like? Is it the same all over the sculpture? Does it heat up when your hands are on it? Does it feel cool to the touch? Then, the next step is thinking how does the media, the material, contribute to the overall effect of work. EW: What was interesting about the material in this show? GK: These are all contemporary pieces and all using atypical media. So you had handmade paper, you had painted Styrofoam, you had molded silicone, and constructions of lots of different material. The silicone fruit was kind of a revelation. When you’re looking at it, from what I understand, it looks like a ghost of a fruit because it’s translucent. But when you touch it, it’s so appealing, it’s playful, it’s fun to handle. 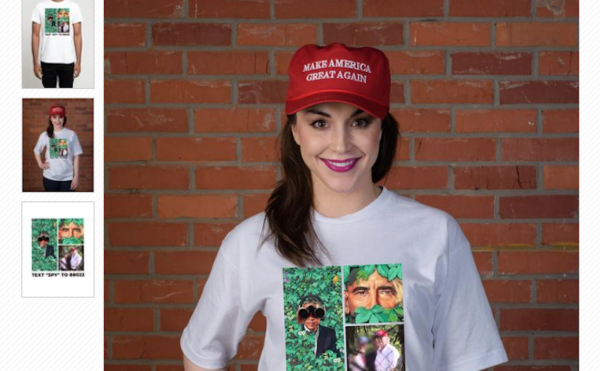 That’s in keeping with the message of the piece. This man is starving and of course the fruit is more appealing than the shofar which is more abstract. Then, the Golem piece has ribbons and string and the figures are so big and the poses so dynamic, but the surface is so complex, and kind of fragile. So touching it you feel like it will fall apart, and that connects with the idea of the Golem that is made out of dirt, made out of mud, and can at any moment disintegrate back to where it comes from. EW: What was interesting to you about working on an exhibit about storytelling? GK: One of the risky things about doing this project was I didn’t want to put forward the idea that what qualifies me to do this is that I’m blind, because I think that ties into a myth that all blind people have some sort of extrasensory perception, and that isn’t true. Part of what qualifies me to do this is I’ve done it a lot and thought about it a lot, so I have techniques of doing it, and I don’t just walk in there and grab something. Specific to that exhibit is all the artists were supposed to respond to a folktale, and I’m a writer — I teach creative writing, I teach literature, so I know a lot about how stories work. Some of the pieces focus on a specific scene in the story, others on a key moment in the story, others focus on key objects in the story and highlight that. It was interesting to me to see what they did and play that against my own reading of the story. EW: What did you get from your parents being artists? GK: I grew up touching their art and touching their materials. My father was a sculptor and my mother was a painter. I know how to stretch a canvas and how to mix oil paints. My father worked in metal — he would go to junkyards and find metal scraps and weld them together, so I knew his work as he was making it and being in the studio and handling all this scrap metal. He taught me how to weld when I was a child, which tells you something about my father to put an acetylene torch in the hands of a blind child. I remember he would make models of his pieces, and a lot of times you go to art galleries and have to help with the installations and carry things. I had a lot of different experiences of their art and their friends’ art. It’s also about the way artists talk about art, overhearing their conversations, sort of absorbing what they saw and what they valued in what they saw. EW: You have stressed how it benefits museums to have disabled visitors. Jewish Folktales Retold: Artist as Maggid continues at the Contemporary Jewish Museum (736 Mission Street, San Francisco, CA 94103) through January 28.